When it came to themes, Emily and Jesse knew there wasn't anything else they wanted but a brewery wedding. "My husband and I bonded over a love of beer. We have matching hops tattoos!" says the bride. While they didn't have the chance to host the wedding in a brewery, their wedding was influenced from beginning to end by the couple's favorite brews. They brought the inventive flavors and casual atmosphere of a brewery to one of Columbia's prettiest venues. 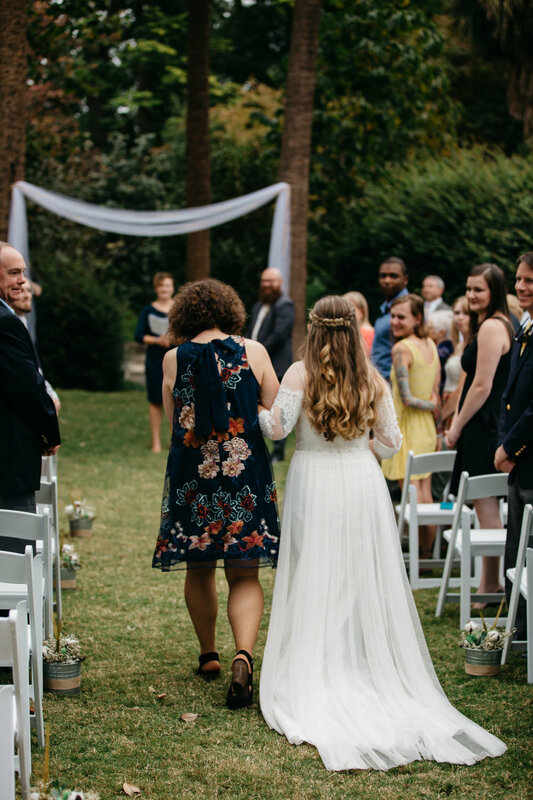 Remembers Emily, "We knew we wanted an outdoor wedding with a very natural feel to it; we decided that the florals would center around hops and the theme of the wedding would be a wedding beer garden. 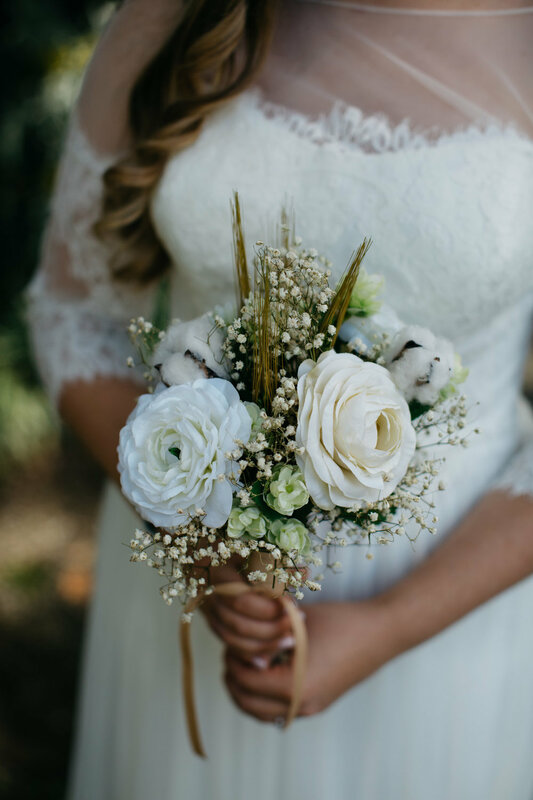 Everything was focused around white and green, and the ceremony and the reception were outdoors with lots of hops and lots of beer." 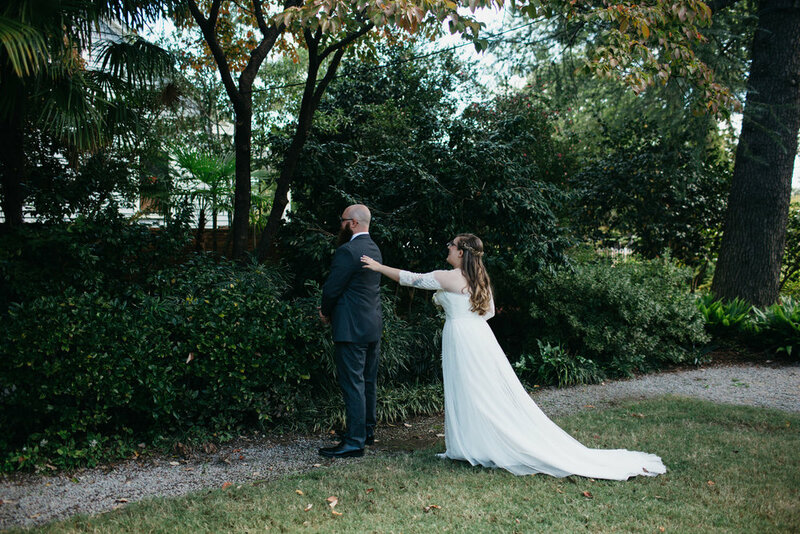 Along with their guests, Emily and Jesse reveled in the lush tropical greenery of the gardens at the Seibels House, and had every gorgeous moment captured by photographer Alexis Schwallier. 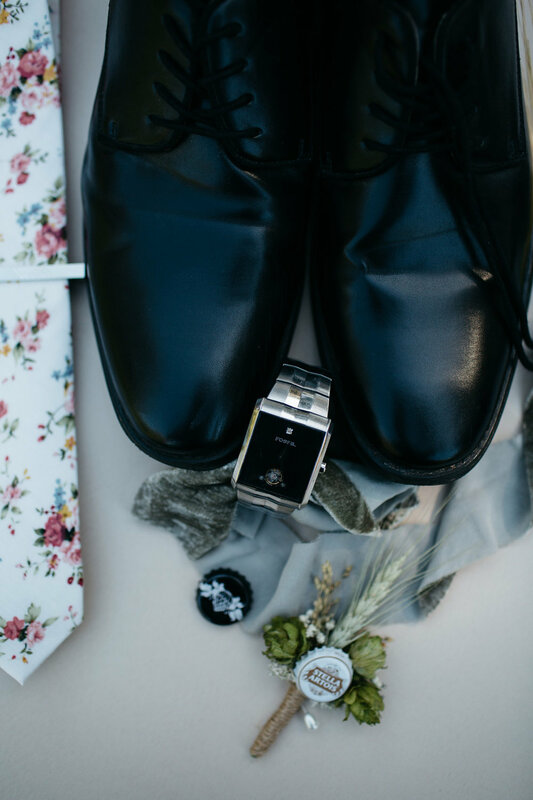 While some couples might deliberate over what they wear for their big day, but for Emily and Jesse, their attire was an easy choice. Shares Emily, "We both do not love shopping for clothes and tend to go with our first instincts. Prior to dress shopping I looked online for what I thought I would be interested in. My dress shopping adventure took a total of 10 minutes- I picked the first dress I tried on and was ready to go!" The shopping went equally smoothly for Jesse. "Jesse wore pants he already owned, and we kept it simple." To create their laid back garden brewery vibe, the couple chose to get married outdoors with simple, modern, and sleek decor. 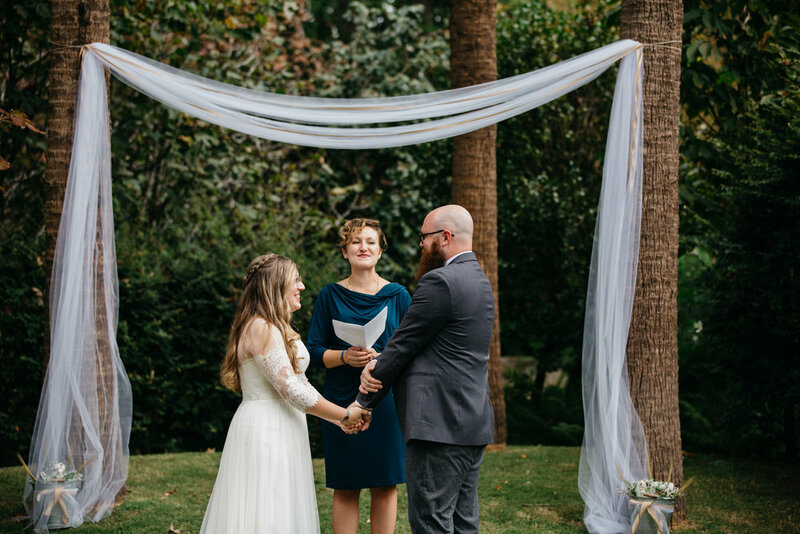 "We had simple white chairs leading up to the "alter" which consisted of large palm trees we simply decorated the aisles with white flowers, and had reserved seating for family," says Emily. Later, the party shifted to the other half of the gardens for the reception. There, Emily and Jesse continued with their green and white florals and brewery theme. Instead of using vases or jars, they used beer growlers to hold their centerpieces. 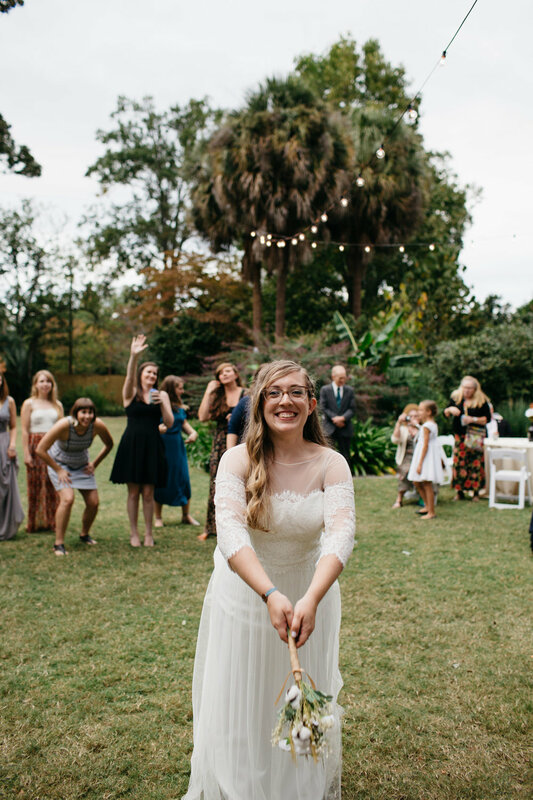 Their guests also had plenty of fun in store for them during the reception. "We both love games and made sure to include games throughout, tic tac toe and corn hole for example," reveals Emily. "Everything was covered with twinkle lights for a lovely garden party. 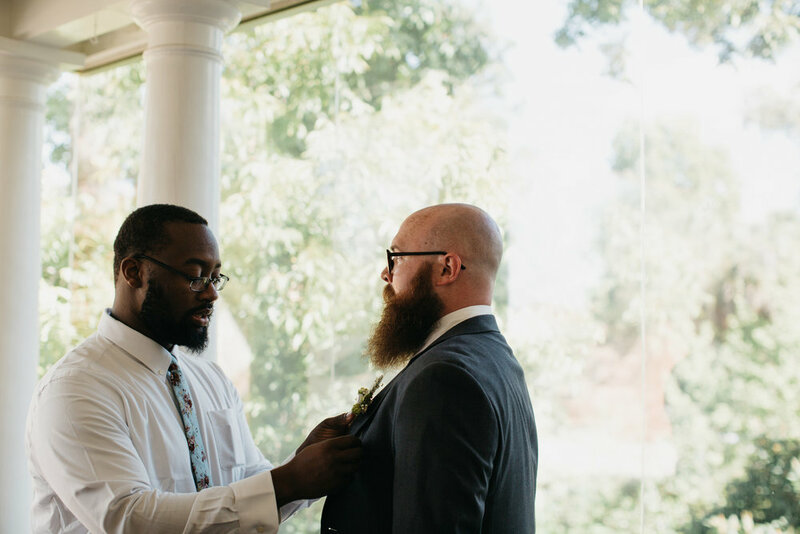 We had plenty of craft beer, and a custom pickle bar in the reception garden." "Let people help! Though it may seem like people are "butting in"- it will be so much easier for you if you delegate a specific task to them to be responsible for (by no means should you give them the most important task!). People love having something to do that they know is going to help you. And this can get them out of your hair"